Canberra Critics Circle: HIPPO! HIPPO! HIPPO! HIPPO! A Big New Musical Adventure. Based on the international best-selling book series There’s a Hippopotamus On Our Roof Eating Cake by Hazel Edwards and illustrated by Deborah Niland. Directed and adapted by Garry Ginivan. Musical direction and original score by Mark Jones. Original arrangements by Tim Smith. Set design GrahamMcGuffie. Lighting Designer Ben Howlett. Production Stage Manager David Kelly. Company Manager Andrew Dunne. A Garry Ginivan Attraction. Produced in association with Shows in Schools. The Canberra Theatre. Canberra Theatre Centre. June 11. 2016. Hippo has left the building! 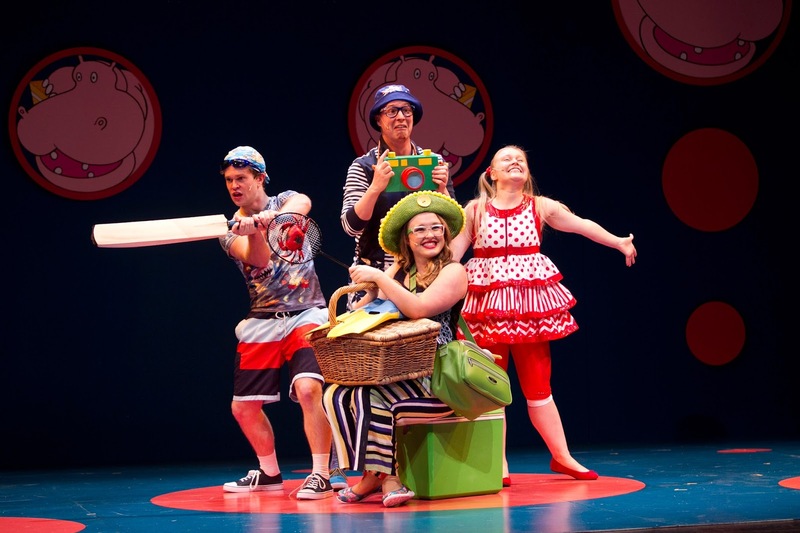 For those lucky enough to have seen Garry Ginivan’s adaptation of the class children’s story, There’s A Hippopotamus On MY Roof Eating Cake, this colourful, lively and delightfully enchanting production will remain in the imagination for a very long time. 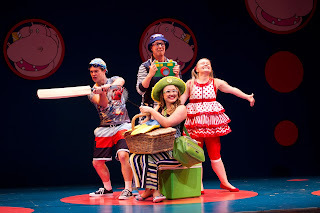 Hazel Edwards’ utterly engaging story of a young girl’s imaginings of a hippopotamus on her roof, eating cake, vividly illustrated by Deborah Niland, is given a fresh, musical interpretation by director Garry Ginivan and his team. A small company of four actors play out the family as well as a doctor at the hospital, jungle characters, her friend at school and the teacher. 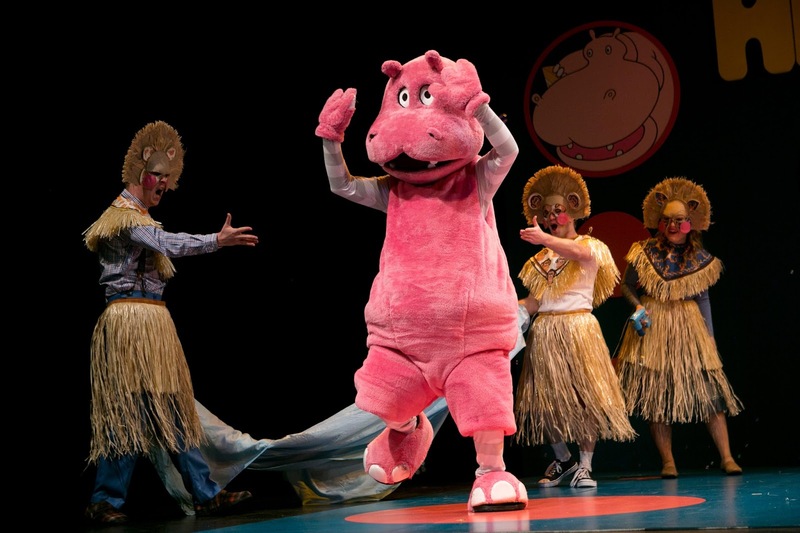 Hippo (Andrew Dunne, mute and hidden in a costume) crosses the stage from time to time as a new imaginary adventure begins. The talented ensemble embrace the vitality and fun of children’s theatre. Eammon George is a happy go lucky affectionate Dad. Rosie Blyth captures the character of the sensible Mum and Dean Schulz is perfect as the bumptious, somewhat irritating and childish Brother. As Girl a.k.a. Moppet to her Dad, Kaisha Durban entrances as the central character of this wonderful musical version of Edwards’ and Niland’s stories. Mark Jones’s songs, arranged by Tim Smith, are catchy, bright and hummable, evoking the percussive rhythms of the African jungle, the sentimental melodies of imaginative play and the joyous tap routine number between Girl and Hippo (Just You and Me). The fifty minute performance all ends in a happy and rousing chorus of Happy Birthday. Even this hardened reviewer choked for a moment as Hippo and Girl hugged goodbye. Maybe I was not the only Moanup, as Brother calls the big people in the house, to feel a little saddened by the inevitable farewell of the imaginary friend. But then Hippo is never really gone. The imagination holds him in Girl’s heart for all time. Every children’s tale will have its moral, and this Garry Ginivan Attraction gently and tenderly introduces the classic story’s salute to the wonderment of the imagination. Dropping character for a while to let the actor play his part. Schulz leads the audience participation in a musical routine to stress the importance of being sun-safe at the beach. He also, engagingly, prompts the large Canberra Theatre audience, children and adults alike, to hide behind their seats, don their imaginary jungle masks and make an almighty noise when GIRL appears. I am cautious of audience participation, but the company handles it with charm, a sense of fun and controlled importance. There is nothing gratuitous about this production. The performers play out their roles with genuine affection for the young audience and with a vitality, devoid of patronizing characterization or token participation. The audience responds spontaneously, laughing, staring wide-eyed at the lovable Hippo and believing completely that there could be a hippopotamus on the roof eating cake. Andrew Dunne as Hippo in Out Of The Jungle. they are certain to remember for a very, very long time – as long as there will be an imagination to brighten up their lives. Promise! CAROLE KING - The Songbook of her life.